2015 dictates a fresh, new beginning for homeowners, especially with Bank Negara Malaysia implementing a new reference rate (Base Rate) to replace the old Base Lending Rate (BLR). What is this new Base Rate and how will it affect borrowers like us? Lets have a look at the two based on their transparency, reflection of monetary policy and the efficiency they inflict. The BLR framework was established in 1983 serving as a main reference on retail floating rate for loans in Malaysia before deciding how much it costs for borrowers to acquire loans. This rate is not determined by the Bank Negara Malaysia (BNM) but by the banks themselves arbitrarily based on their internal cost of funds. This cost of funds is in line with the Overnight Policy Rate (OPR). However, BNM can indirectly influence the BLR by making changes to the OPR depending on the current state of global economy and its objectives. Banks will quote an interest of BLR plus or minus a percentage. For example, let’s say the prevailing BLR is 6.80% and the BLR offered by the bank is BLR-2.3%. The actual interest rate for your loan is 4.5% (6.8 – 2.3). For more examples of BLR, click here. This is the new interest framework that is effective as of 2 January 2015. The interest rate charged by the banks for a loan will now comprise of Base Rate and its desired spread. The Base Rate will be determined by the banks’ benchmark cost of funds and the Statutory Reserve Requirement (SRR). Other components such as borrow credit risk, liquidity risk premium, operating costs and profit margins will be reflected in a spread on top of the base rate. Banks will charge you an interest of the sum of two components. 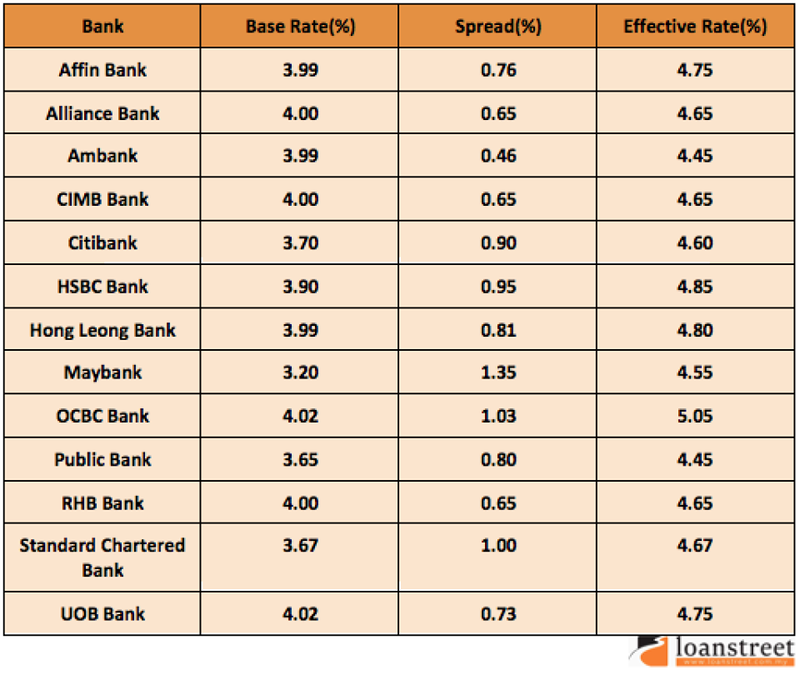 The latest base rate as of 2 January 2015 for CIMB Bank is 4.00% with spread yet to be released. For illustration purposes, say it’s 0.65%. So, simple addition implies the interest rate to be paid is 4.65%. For BLR, the rate is an arbitrary number that is derived from their cost of funds plus other factors. There is no clear indication of the breakdown of interest rates charged . However, the new Base Rate framework points out the allocation for the cost of funds and their spread components. This increases the visibility of the factors underlying changes to the Base Rate. The Base Rate consists of SRR for the purposes of liquidity management. If BNM believes the banking system is lacking liquidity, it may raise the SRR to keep more money as reserves. This leads to lower loan growths for banks as there are less funds available for lending. So, by analyzing the change in base rate, we can reflect the effectiveness of the monetary policy. With the transparency of the breakdown, banks are stimulated to show attractive base rate for borrowers as it reflects efficiency in the making, thus achieving good credit ratings. They would also try to achieve low operating cost and risk and possibly increase leeway for profit margin. However, the smaller institutions may risk losing out in getting more borrowers for loans whereas bigger banks have more room to maneuver when determining the reference rates. The change in the framework could result in some anxiety. There is limited information on how this change will affect the products available to us but BNM claims that it should not have any impact on the effective lending rates charged to borrowers in terms of the credit standing and market funding rates. There is no change in the general level of domestic interest rates, merely a change in the system. For existing loans, it follows the old BLR system except for loan refinancing and new loans. So, banks are still required to display both their Base Rate and BLR at all websites. Any adjustments made to the Base Rate, a corresponding adjustment to the BLR will also be made for existing loan reference. The effects of the new system on loans and repayments is far from being conclusive. Will it prove to be a more efficient mean to the old model or will it impose more complications? Only time can tell. It should make more sense to do even more comparisons within banks during the midst of implementation. In the mean time, feel free to ask us anything if you have any enquiry.